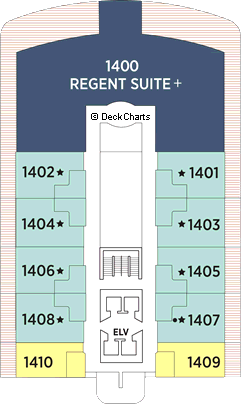 Regent Seven Seas Explorer, “The Most Luxurious Ship Ever Built” and largest in Regent’s growing fleet, is spaciously intimate, breathlessly elegant and perfectly staffed to offer Regent Seven Seas Cruises’ special brand of ultra-luxury. All-inclusive, all-suite cruising at it's apex, Seven Seas Explorer boasts 369 all-balcony staterooms allowing you to journey to the world’s most beautiful places in decadent style. It's a mix of over-the-top service, marble by the acre and guest suites so opulent, it's almost impolite to call it a cruise ship. Indulge in a relaxing treatment at the world renowned Canyon Ranch SpaClub, enjoy a musical performance in a plush lounge, and delight in extensive gourmet dining throughout the day and night with culinary options including modern French cuisine and classic Italian dining under the stars in six open-seating gourmet restaurants. Onboard amenities enrich the journey from a nine-deck atrium to an immersive culinary education program to one-of-a-kind original artwork to ornate two-story theater showcasing Broadway-style performances.